The hub of activity takes place in the 178,000 sq feet purpose built warehouse in Gloucester, within close proximity of the ports. The bulk storage in the warehouse stores 16,500 pallets in racking, reaching 14 metres high. The Distribution Centre employs more than 400 people on site including the call centre team. They despatch approximately 45,000 cases of wine a week, however, demands on the business double or even triple during the peak Christmas period (Oct – Dec) and subsequently so does the resource, transforming into a 24/7 operation. 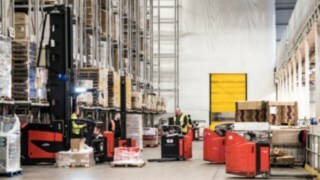 To help shape the design of the warehouse and identify the exact mix of trucks required to run the operation efficiently Linde introduced STRATOS. This enabled us to advise Laithwaite’s Wine on warehouse design to maximise efficiency within its operation. Linde recommended a fleet of 38 trucks including powered pallet, reach, counterbalance and K trucks to help the business deliver quality wine, on time, to customer’s doorsteps. Steven Walker, Operations Manager at Laithwaite’s Wine explains: “When we are looking for a materials handling supplier, we are looking beyond the product, and taking customer service into account as this is key to our business. With Linde we have an engineer who can be on site within two hours to assist us with any problems. They also have storage of parts in the UK which includes delivery overnight direct to engineers vans.” This ensures maximum uptime giving the operation confidence in achieving service on every level, more importantly for our customers.